Chemists at the University of California, Riverside have constructed liquid crystals with optical properties that can be instantly and reversibly controlled by an external magnetic field. The research paves the way for novel display applications relying on the instantaneous and contactless nature of magnetic manipulation-such as signage, posters, writing tablets, and billboards. Commercially available liquid crystals, used in modern electronic displays, are composed of rod-like or plate-like molecules. When an electric field is applied, the molecules rotate and align themselves along the field direction, resulting in a rapid tuning of transmitted light. "The liquid crystals we developed are essentially a liquid dispersion, a simple aqueous dispersion of magnetic nanorods," said Yadong Yin, an associate professor of chemistry, who led the research project. "We use magnetic nanorods in place of the commercial nonmagnetic rod-like molecules. Optically these magnetic rods work in a similar way to commercial rod-like molecules, with the added advantage of being able to respond rapidly to external magnetic fields." Yin explained that upon the application of a magnetic field, the nanorods spontaneously rotate and realign themselves parallel to the field direction, and influence the transmittance of polarized light. Study results appear online in Nano Letters. How light passing through the magnetic liquid crystal is controlled simply by altering the direction of an external magnetic field. The magnetically actuated liquid crystals developed by the Yin Lab have several unique advantages. First, they can be operated remotely by an external magnetic field, with no electrodes needed. (Electrical switching of commercial liquid crystals requires transparent electrodes which are very expensive to make.) Second, the nanorods are much larger than the molecules used in commercial liquid crystals. 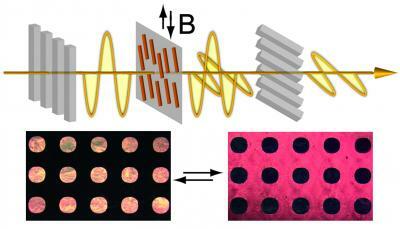 As a result, their orientation can be conveniently fixed by solidifying the dispersing matrix. Further, the magnetic nanorods can be used to produce thin-film liquid crystals, the orientation of which can be fixed entirely or in just selected areas by combining magnetic alignment and lithographic processes. This allows patterns of different polarizations to be created as well as control over the transmittance of polarized light in select areas. "Such a thin film does not display visual information under normal light, but shows high contrast patterns under polarized light, making it immediately very useful for anti-counterfeit applications," Yin said. "This is not possible with commercial liquid crystals. In addition, the materials involved in our magnetic liquid crystals are made of iron oxide and silica, which are much cheaper and more eco-friendly than the commercial organic molecules-based liquid crystals." The liquid crystals may also find applications as optical modulators -- optical communication devices for controlling the amplitude, phase, polarization, propagation direction of light. The discovery came about when Yin's lab first had the idea of using magnetic nanorods to replace rod-shaped molecules in commercial systems to produce liquid crystals that can be magnetically controlled. After looking into the literature, the research team realized that the main challenge in producing practically useful magnetic liquid crystals was in the synthesis of magnetic nanorods. 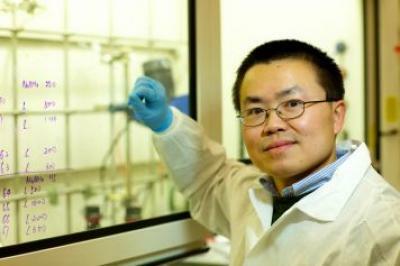 "Prior attempts had been limited to materials with very limited magnetic responses," Yin said. "We utilized our expertise in colloidal nanostructure synthesis to produce magnetite nanorods that can form liquid crystals and respond strongly to even very weak magnetic fields -- even a fridge magnet can operate our liquid crystals."